Each spring the University celebrates several outstanding staff members who have demonstrated significant and longstanding contributions to the University. The recipients of this year’s staff awards will be recognized at an April 30 reception in Helen Wood Hall. Their names will also be inscribed on plaques in the Medical Center and in Wallis Hall on the River Campus. The Witmer Award for Distinguished Service is presented to staff members whose careers have been characterized by outstanding and sustained contributions to the University. Lucy Carroll has demonstrated her commitment to excellence in many ways during the nearly 40 years she has served the University—and she does so with warmth and a sense of humor. Joining the University in 1978, Carroll held positions in the Department of Obstetrics and Gynecology and the Department of Surgery before moving to the School of Nursing in 1994. In addition to managing the dean’s calendar and travel schedule, she fosters a welcoming environment in the dean’s office through her genuine and friendly nature. That’s enabled Carroll to build relationships with many faculty, staff, and students over the years. “Her commitment to the School of Nursing is second to none. Whether it’s with the faculty, staff, students, donors, or my patients, she works to make everyone’s life easier, better, or more enjoyable. And she certainly does so for mine,” writes School of Nursing Dean Kathy Rideout, in a letter nominating Carroll for the award. In addition to her front-line role in the dean’s office, Carroll organizes the school’s convocation, accelerated program for non-nurses pinning ceremony, Meliora Weekend events, all-school meetings, academic program orientation, commencement and other events important to the school. She “puts her heart into every detail,” recognizing that some of the events are life-changing to some of the people involved. Colleagues says Carroll is a consistent partner whose understanding of the school, the Medical Center, and the University has been invaluable to those with whom she works. 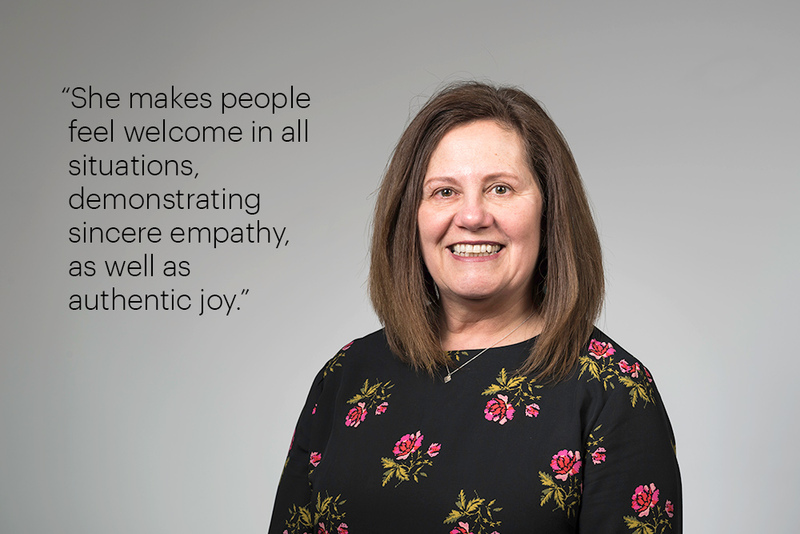 Dependable, knowledgeable, and resourceful are just a few words colleagues use to describe Wendy Keck and the far-reaching impact she’s had at the University. Keck joined the University in the Department of Orthopaedics in 1973 before moving to Physiology in 1978, where she worked for 17 years. She moved to the Center for Oral Biology in 1999 and took on several leadership positions there. In her current role, she is chief administrator and chief financial officer for one of the largest basic science departments at the University. She manages more than $10 million in extramural research funds annually and coordinates several NIH-funded training programs. In addition, she oversees several centers and facilities, such as the Upstate Stem Cell cGMP Facility, the Center for AIDS Research, and the Genomics Research Center. “From her outstanding management of department resources, to sound guidance and knowledge assisting faculty with extramural funding opportunities, to personnel management and her knack for team building, Wendy is a shining example to follow, particularly for early administrators such as myself,” writes Daisy Bird Geer, finance manager for the Department of Microbiology and Immunology. Colleagues supporting Keck’s nomination repeatedly highlight her willingness to go the extra mile, her constant commitment to improvement and cost savings, and her dedication to the University’s mission and values. 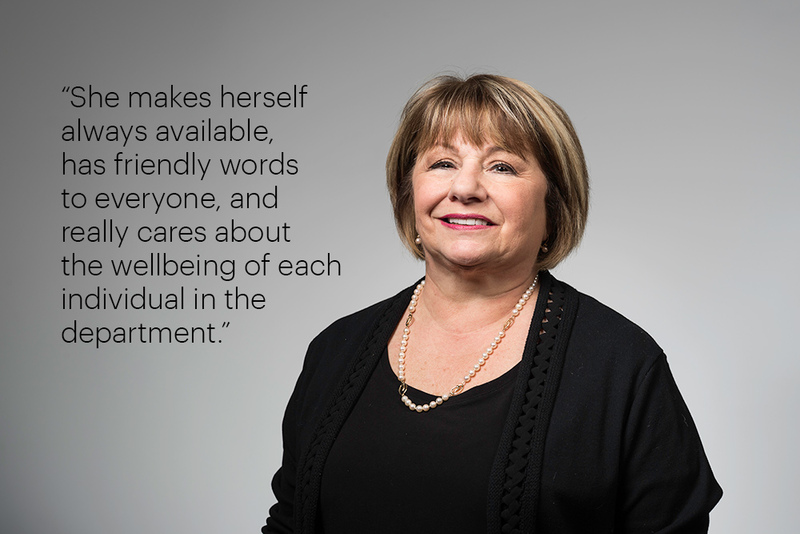 Barbara Tanski is a professional, dedicated, and caring colleague who is always willing to help. During her two decades of service to the University, her impact has been felt not only among those who work directly with her, but at multiple community organizations that receive donations of money, goods, or services from University faculty and staff. As administrator in the Office of the Provost, her key responsibilities include managing office purchases, travel reimbursements, and financial accounts for offices that report to the provost. She also tracks academic leaves and makes sure the financials are in order so that faculty are properly compensated, among other responsibilities. “Barb is truly a dedicated, loyal employee who works relentlessly to make sure the office and people in it have the highest level of support,” writes Gigi DeMita, executive assistant to the provost, who nominated Tanski for the award. 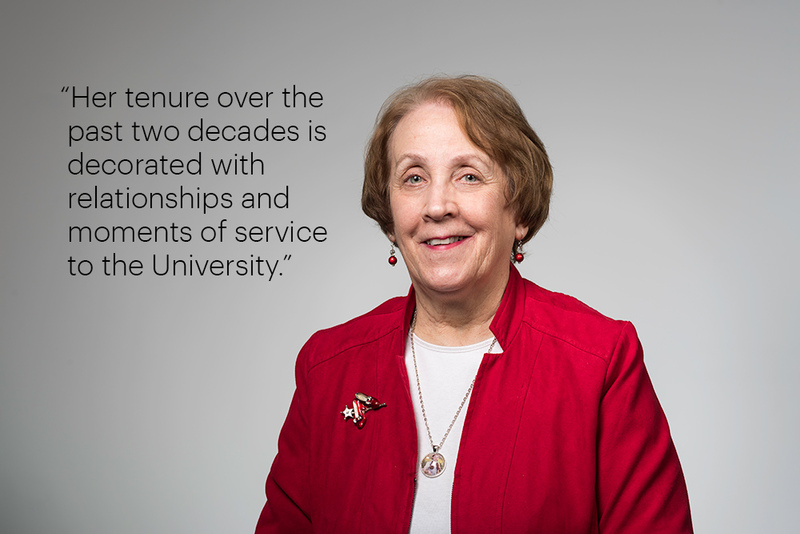 “Her tenure over the past two decades is decorated with relationships and moments of service to the University. “With her vast knowledge and caring personality, Barb goes out of her way to help find whatever solution is needed,” writes Provost Rob Clark. Before joining the Provost’s Office, Tanski was the Finance Office manager and administrator to the University controller for nearly 10 years. She often worked extra hours to pull together financial statement files and board materials during audits. She is always thinking about ways to save the department money, nominators say, and often finds creative ways to do so—such as keeping a collection of reusable office supplies to share. Throughout the year, she organizes office collections for local charities, such as Foodlink and the American Cancer Society’s Making Strides against Breast Cancer Walk, and for disaster relief efforts. She has been a representative for the University’s United Way campaign since she joined the University 1998. The Meliora Award recognizes staff members whose work performance and dedication during the preceding few years exemplify the University’s motto, Meliora. 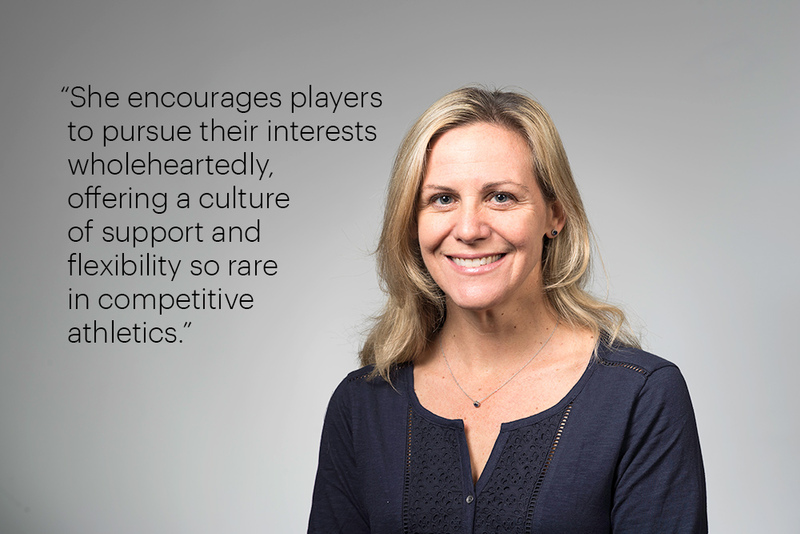 Wendy Andreatta has led the University’s field hockey team to many winning seasons since she became head coach in 2007—but her impact extends well beyond the field. She is a trusted colleague, mentor, and friend to many—as well as a champion for the sport of field hockey in the Greater Rochester region. Under her leadership, the Yellowjackets are 157–70 and have had 11 straight seasons with 10 or more wins. She has coached nine players to All-America honors. Twenty-nine of her players have earned a total of 52 All-Liberty League awards. The field hockey team earned a trip to the NCAA Division III playoffs for the past three years, advancing to the Elite 8 round twice. “In addition to her positive personality, dynamic coaching style, and love for the University of Rochester, Andreatta’s understanding of the Meliora mission combined with the Division III mission draws top academic performers,” writes nominator Sarah Dixon ’13, ’15N, who worked with Andreatta as both a player and assistant coach. Andreatta has been recognized as North Atlantic Regional Coach of the Year by the National Field Hockey Association and her team has earned coaching staff of the year honors from the Liberty League and the National Field Hockey Association. She also contributes to the growth of the sport in Western New York, as founder of Finger Lakes Field Hockey, a Rochester-based travel field hockey team. Seated, from left: Keri Grimes, Kathleen Strout, Dawn-Chamane Bush, Kevin Turley. Standing, from left: Mary Mottler, Stephanie Krause, Janet Connor, Elisabeth Foster, Cary Jensen, Rani Bhagwat; Stephanie Johnson, Carly O’Keefe, Wendy Owens, Molly Murray, Sumie Jacoby, Lena Ovcharov. The International Services Office plays a crucial role in supporting Rochester’s international student community, a population that has more than doubled in the past 10 years. Office staff provide comprehensive visa and immigration services for international students and scholars studying and working across the University. They have done so within a fluid regulatory environment, which has recently included executive orders affecting immigration policy, interpretation, and implementation, as well as challenges to the Deferred Action for Childhood Arrivals policy. All the while, they have stayed committed to making the campus a more inclusive environment that supports individuals from around the world. 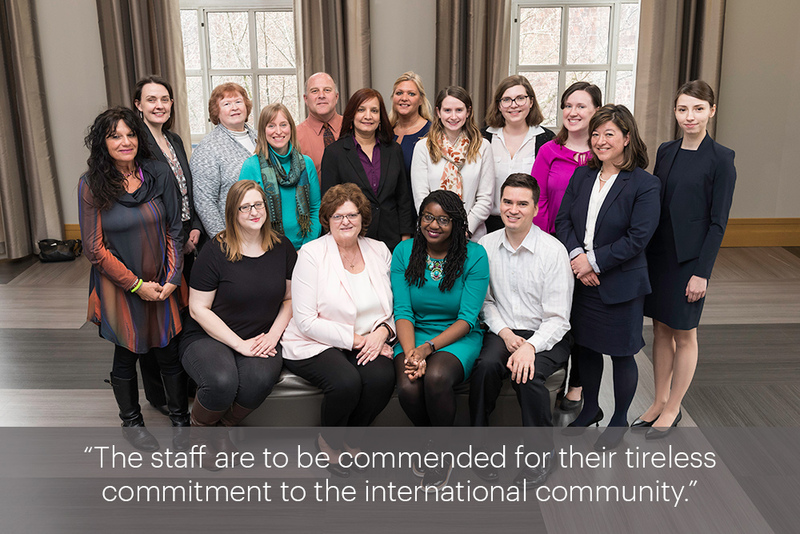 Front row, from left: Lynn Fine, Deborah Humphrey, Donita Gorman, Andrew Rudmann, Paul Graman, Shayne Hawkins, Ghinwa Dumyati, Susan Goodrich, Patricia Reagan Webster. Back row, from left: Casey Calabria, Tamsan Cleveland, Lynne Brown, Harvey Gamble, David Lent, Michael Van Roo, Cathleen VanHouten, Stephanie Shulder. Not pictured: Dan Mancuso, Kate Miller, Mark Ott, Robert Panzer, Kathy Parrinello, Katherine Shaw, Brenda Tesini, Jennifer Redshaw Trask, and Pat Witzel. 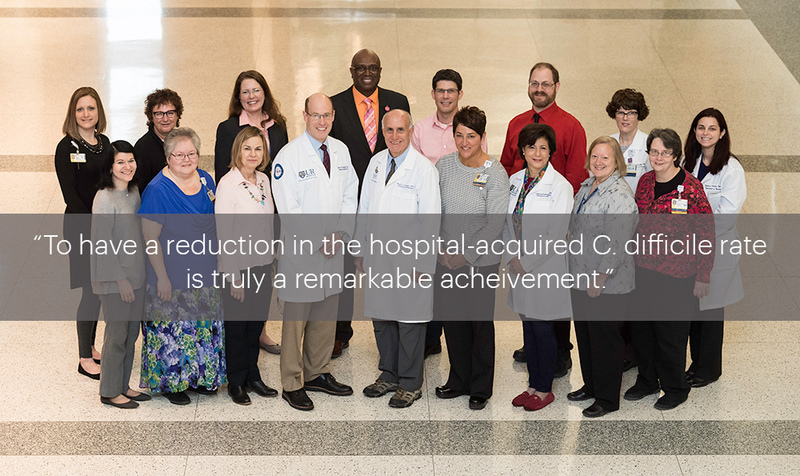 Members of Strong Memorial Hospital’s C. difficile Infection Prevention Task Force are being honored for their multifaceted approach to solving a challenging problem—the spread of hospital-onset C. difficile infection (CDI), a potentially deadly infection that causes severe diarrhea and colitis. The task force—which includes representatives from the departments of medicine, nursing, infection prevention, environmental services, critical care nursing, quality improvement, and pharmacy—was created in 2011 to combat the infection’s spread in the facility. The goal was to identify strategies to reduce the incidence of hospital-acquired CDI by 30 percent. Around 230 patients who contracted CDI in the community or at another health care facility are admitted to Strong Memorial Hospital each year. At the time that the taskforce was formed, an additional 200 patients acquired CDI while they were at Strong. Initial efforts focused on enhanced cleaning guidelines. Guidelines for C. difficile testing were reviewed and revised. Personal protective equipment was placed outside patients’ rooms. When the team’s first few years of efforts yielded small reductions, they kept introducing new measures to further disrupt the spread of the infection. Pharmacy and health care providers worked together to ensure wise use of antibiotics when treating the infection. The task force supported the Wash-Glove-Wash hand-hygiene campaign. Residents, hospitalists, and advanced practice providers were educated on current guidelines for testing for the infection. Environmental Services also enhanced their cleaning methods to more effectively target C. difficile spores. “Their educational initiatives have impacted countless trainees and faculty, and the systems changes have ensured that these improvements will be resilient,” writes Valerie Lang, an associate professor of medicine, in a letter supporting the team’s nomination. The cumulative effect of their work has significantly reduced infection rates—by 33 percent, exceeding the original 30 percent goal. “In a busy institution where we see occupancy rates over 100 percent daily, to have a reduction in the hospital-acquired C. difficile rate is truly a remarkable achievement,” writes Dwight Hettler, associate director or nursing/clinical operations at Wilmot Cancer Institute, in a letter supporting the team’s nomination. The Staff Community Service Award honors a nonmanagement staff member whose commitment best exemplifies service to the University and the Greater Rochester community. Christle Pajrowski is being recognized for her tireless efforts to help the community’s homeless pet population. Since 2014, Pajrowski has worked with Greece Residents Assisting Stray Pets (GRASP), a nonprofit organization committed to reducing the number of homeless pets in the town of Greece by promoting responsible pet ownership and placing homeless dogs and cats into loving permanent homes. 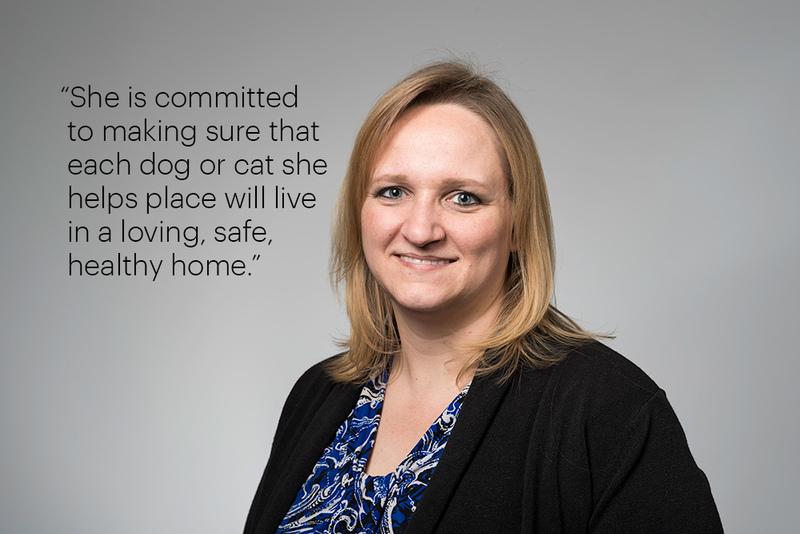 She’s willing to do anything to help: From transporting pets, to staffing pet adoption events, to fundraising, Pajrowski has done it all. “Our nonprofit group is made up of 100 percent volunteers and knowing Christle is someone that can be relied upon in a moment’s notice to do whatever is needed contributes greatly to our success,” writes Tami Becker, a “cat team” coordinator with GRASP, in a letter supporting Pajrowski’s nomination. She has fostered countless stray animals before they are transitioned to new homes. She works with feral cats to help them learn to better interact with people so that they may someday be placed in someone’s home.